This Halwa is very popular in Sylhet, Bangladesh..They call this halwa “Tosha Shinni”..Being the “Sylheti Bou”, my first attempt to learn this super delicious halwa was not so pleasant!!! !I found the process pretty complex (unnecessarily)and my husband challenged me saying ” you r too young to make this halwa”!!!!!!!!!!!! What ??????!!!!!!!! !I took the challenge and made this within no more than 10 minutes !!!!! Alhamdulillah my husband couldn’t believe that it can be made so quickly without compromising on taste !!!!! All the ingredients , Maida,ghee,sugar,oil, water, should be of equal amount. For the beginners ,you can just cut the recipe in half..try it with half cup..:) ..Just remember all the ingredients, except the garam masala should be in equal amount. 1.Make a sugar syrap with 1 cup sugar and 1 cup water . While making the syrap , add the cardamoms, Cinnamon and bayleaf in it. The syrap should be thin. 2. In a pan , heat ghee+oil and add the flour in it. Fry on medium low flame, stirring continuously til its brown..The more you fry the darker the color of halua would be..But don’t over fry or burn it.Some love light brown color of halwa, so they fry less , just until it gets light brownish color. My hubby loves it a little darker, so I fried until its brown. 3.Add the sugar syrap…The flour will soak the syrap. 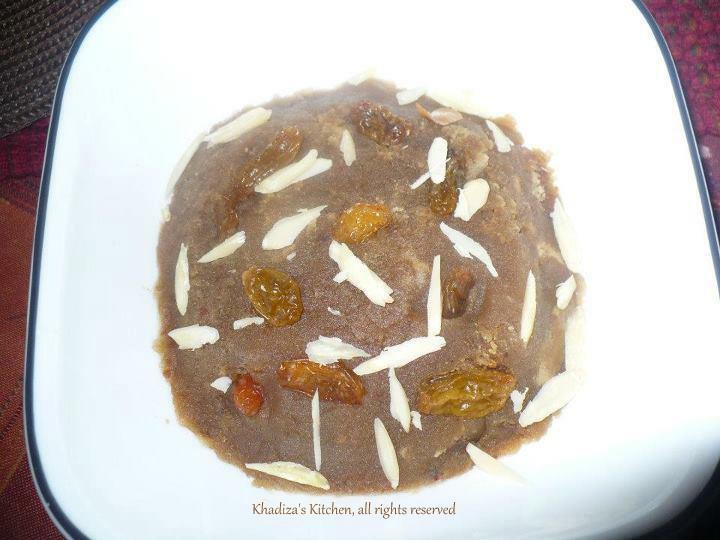 When the halwa will come together, it’s ready.You may sprinkle some rose water before serving. 4. Garnish it with chopped nuts and raisins. Blend eggs, milk, sugar and little food color together …Use a Whisk or egg beater to blend them..Add some rose water..In a pan add ghee/oil..Fry the garam masal for a while…Add the egg mixture…Stir frequently on medium low flame until l it forms small granules and oil separates…..Careful don’t burn it or make it brown and the water should be dried out( it releases water)..You may add nuts and raisins but before serving take out the garam masala…that’s it.. u r done!!! !enjoy.